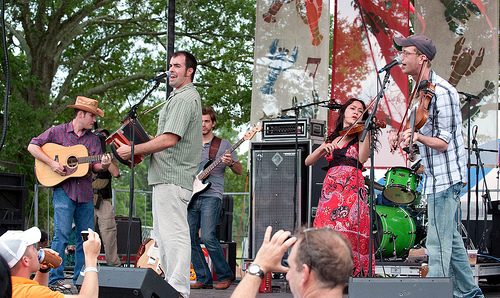 Beloved internationally and in their hometown of Lafayette, La.—where the band was formed in 2005 and where members Drew Simon and Thomas David were born and raised—the Pine Leaf Boys perform tonight at the Park at the Horse Farm at the Levitt AMP Lafayette Music Series, bringing their neo-traditional music to a space considered one of the last undeveloped properties in Cajun country. Learn more about the band before they take the stage at 6:30 p.m. tonight! 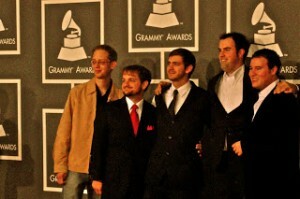 The Pine Leaf Boys are four-time GRAMMY nominees. Though the category of “Best Zydeco or Cajun Music Album” was short-lived, the Pine Leaf Boys scored nominations from 2008–2011, every year the honor was presented. They hold the record for the most GRAMMY nominations of any Cajun/zydeco band. The band had an unconventional start: getting kicked off of University of Louisiana at Lafayette’s campus. After being told that their busking was disturbing the peace, the fledgling band started landing gigs when their story took off on local media. But there’s no bad blood with the university—bandleader/accordionist Wilson Savoy later taught Cajun music at the UL Lafayette’s School of Music’s Traditional Music program. Bandmates Wilson Savoy and Courtney Granger appeared in HBO’s Treme as themselves. Wilson Savoy (center left) and Courtney Granger (far right) appeared in HBO’s Treme. 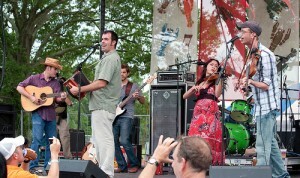 Savoy, who won a GRAMMY in 2012 with Steve Riley and Wayne Toups as The Band Courtbouillon, appeared in three episodes of the critically acclaimed series about post-Hurricane Katrina New Orleans; the fiddling Granger appeared in one episode. Ready to get dancing? Head down to the Park at the Horse Farm tonight for a free show by the Pine Leaf Boys! And if you’re in Anchorage, Arlington, Bethlehem, Denison, Frederick, Los Angeles, Memphis, Pasadena, Sheboygan or Westport, check out the other free concerts happening this week at the Levitt. Be sure to tag your Levitt concert pics with #musicmoves to appear in our live feed and earn a chance to win a $100 iTunes gift card!